Tastefully furnished and equipped house on an ideal location with a sea-view terrace. This fully renovated apartment is located in the central part of the beautiful Mazzarò seaside area in Taormina, just 100 m away from the funicular railway to Taormina’s centre. It sits opposite to Mazzarò Beach and 200 m away from Isola Bella Beach. This house enjoys a fantastic location, a nice balcony overlooking the bay of Mazzarò, and a splendid panorama. This is an ideal location for enjoying your holiday in Taormina with high-quality comforts. The apartment is composed of an entrance, a fully equipped kitchen, a living room with double-glass windows overlooking the large balcony facing the bay of Mazzarò, an LCD TV, a large double sofa, a dining table, a master bedroom, and an extra chair-bed/baby cot if needed. It also features a shower room, a washing machine, air-conditioning, one hairdryer, an electric iron, an ironing board, and a fridge. Garage and swimming pool are available on request. Maime and Jacqui's fab few days.! Mare Mare Mare is a stunning place to stay ( mind you, you need good quads !!) It's position and closeness to all amenities , it's access to beach and transport etc is A! Mirella is a wonderful hostess who helped my daughter and I with so many queries. Nothing is too much bother for her in making sure you are satisfied and happy. GO THERE ! 'Big thankyou Mirella for all your kindness to us .Would love to return ! Mirella was wonderful, waiting up for us as we got in really late and promptly helping us when the washing machine door wouldn't open. The property is gorgeous with beautiful views, close to amenities and the beach and overall very relaxing. There is only 1 bedroom though. The double bed is actually the sofa bed in the living room. Not sure where you'd sleep a 5th person. And it was a good view, but not actually the one in the photograph here. The flat was spacious and light, with a nice terrace with furmiture and umbrella and a view along the coast, and it was scrupulously clean. We received a warm welcome, but were surprised that there was no information about the area in the flat. The kitchen area has a proper stove, but is not really one for keen cooks because work surface space is pretty limited. In terms of location, it is very well situated near the funicular up to Taormina and the Isola Bella beach, which we especially enjoyed in the evening. You need a small car to negotiate the parking space, which is at right angles to a steep, narrow driveway. This apartment has many things going for it, but the most exceptional feature is the view from the ample terrace. The pictures on Homeaway do not do it complete justice. Relaxing on the terrace with a glass of wine while enjoying the spectacular views gives meaning to the term "la dolce vita." The interior of the apartment consists of a living/dining/kitchen area, one good-sized bedroom, and a nice bathroom with washing machine. It is attractively decorated and very clean. Staying in Mazzaro is a good alternative to Taormina. It is smaller and quieter than Taormina (basically it serves as Taormina's beach area), but it is only a short funicular ride away from Taormina. The funivia, as the funicular is called, is a short walk from the apartment and runs every 30 minutes or so. The apartment has a dedicated parking space which is a real plus because parking is hard to come by in Mazzaro. However, the parking space is only suitable for small cars. We had a Fiat 500 which fit but a larger car would not have. There is a paid parking area adjacent to the funicular if a larger parking space is needed. An added advantage of the apartment is that it is located a short drive from the interchange for the autostrada (super highway). This is important because it is no fun driving through the small towns every time you want to go somewhere. The owner of the apartment, Mirella, who is a very nice person, met us when we arrived and gave us some very useful information, in particular the location of the closest supermarket, which is not far away. I do not hesitate to recommend this apartment and would happily return there if we visit the area again. The location is awesome, the apartment is located right next to Isola Bella and Taormina is just a small driving distance away. The view is wonderful and the balcony is nice for having breakfast. On the downside the furnishing was okay, but nothing special. No wifi, TV was present but not working and shower was rather a dribble. But that's minor stuff. Recommend! Lovely spacious apartment in between the sea and Taormina, well supplied with everything you need for a holiday, including the basics needed in the kitchen (salt, pepper, coffee, oil, etc.). 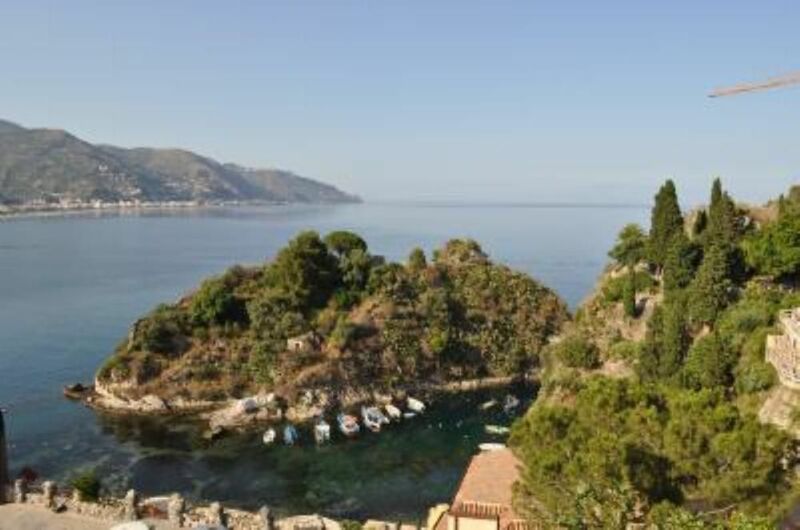 Easy walking distance from the beach and the cable car up to Taormina town. Very helpful and pleasant owner. Loved everything except the beach bar and hotel owners telling us we could not put our beach mats in front of their sunbeds - the English are not used to beaches being privatised! Abituati a viaggiare e si vede. Da consigliare a tutti. Take the Messina/Catania motorway, exit at Taormina, turn towards the sea, and then follow the road signs to Taormina Mare (Mazzarò).